Octocorals include some of the best beginner corals, the Soft Coral and Leather Coral, and other popular corals like Gorgonians, Blue Coral and Organ Pipe Coral, and the intriguing Sea Pens and Mat Polyps! The Organ Pipe Coral is unique and distinct, with pretty red calcite tubes that resemble the pipes of an organ! The Organ Pipe Coral or Pipe Organ Coral Tubipora musica is actually a soft coral, rather than a stony coral. But it is quite a unique soft coral. LIke the Green Star Polyps Pachyclavularia violacea, the Organ Pipe Coral is a mat polyps and a member of the Tubiporidae Family. It is one of only two types of familiar Octocorals that calcify an external skeleton. The other is the Blue Coral or Blue Fire Coral Heliopora coerulea. These two are also the only two corals with colorful skeletons, red and blue respectively. Tubipora colonies are massive, formed of generally upright parallel tubes connected on horizontal platforms. These tubes are actually sclerites. The sclerites are fused to form the skeleton rather than being a hard calcareous skeleton like that found on stony corals. Not only does the colony grow on multi-level horizontal platforms that form a "step like" growth pattern, the many thin, small, fragile tubes look like little pipes, thus its common names Organ Pipe Coral or Pipe Organ Coral. T. musica can grow over 12" high (30 cm) and over 24" (60 cm) across. The Organ Pipe Coral has a striking handsome appearance. It has a beautiful bright or dark red colored skeleton. Its polyps are housed inside the many tubes, but the beautiful red skeleton is usually hidden when its polyps are extended. Yet the polyps themselves provide a striking contrast to the tubes with numerous color variations of white, silver, cream and green found on different specimens.. The Tubipora genus is moderate to care for, with different sources saying it can be easy or hard. There are a few things that are needed to help this coral survive. It likes nutrient rich waters and can be sensitive to excessive skimming. They need moderate with turbulent water flow. One directional water flow is not suggested, as it will stress the coral and not allow for polyp expansion. They do fine under Metal Halides, but beware of algae that can quickly overcome this coral. They can also grow under moderate lighting, but be sure to supplement them with fine particulate foods. Organ Pipe Coral, with, well organ music! This video uses organ music as a back drop for this Organ Pipe Coral. This video does well to show more of the inner structure of the coral, with the individual "pipes" for each polyp. Colonies can reach 12" tall and 24" around, so a 50 gallon or more tank is needed. Bright lighting with feedings of artemia nauplii, rotifers, or dissolved frozen foods with fine particulates are needed. They must have a deep sand bed or refugium to produce other particulates in the water. This was the key in keeping them long term. Organ Pipe Corals like moderate to strong water movement. 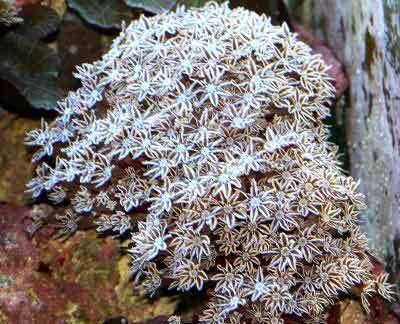 Distribution / Background Soft Coral Information: The Tubipora genus was described by Linnaeus in 1758. Only one species, Tubipora musica, is known, yet 4 additional species have been suggested. The absolute beauty of the coral's red base has made it a popular with curio collectors. Many natives use the "pipes" as jewelry or ornaments to sell to tourists, possibly contributing to their decline in the wild. Some common names these corals are know for are Pipe Organ Coral or Organ Pipe Coral. T. musica has been propagated in captivity. The Red Sea, then south, along the east coast of Africa, ending parallel to Madagascar's southern tip. They then extend from the southern tip of Madagascar northeastward to the Cocos Ridge. From there the habitat extends back in a southeastern direction to the Houtman Abrolhos Islands on the lower western coast of Australia, including the Great Barrier Reef, then all around the northern and half way down the east coast. From just north of the Lord howe Islands, they continue to New Caledonia, Vanuatu and north to the Marshall Islands, then continuing northwest toward the southern tip of Japan. They are then found in all waters of the Indonesian Islands, and extend west to the Maldives Islands bringing us back to the Red Sea. Tubipora Coral Habitat: The Tubipora genus are found on reef slopes in waters that are calm and they are usually found with other soft corals. The depths they inhabit can be from 10 - 50 feet (3-15 m). Status The Tubipora genus is on the IUCN Red List for Endangered Species as Near Threatened (NT). The skeleton of brittle tubes can be dark red to bright red, and its polyps are housed inside the tubes. The polyps can be green, gray, cream, silver, or white in color. The size, length, and diameter of the tubes and tentacles can be considerably variable. T. musica can grow over 12" high (30 cm) and over 24" (60 cm) across. Difficulty of Care Soft Coral Care: The Organ Pipe Coral T. musica is moderate to care for, with different sources saying it can be easy or hard. The biggest obstacle can be obtaining a healthy specimen to start with. Making sure that your coral is collected along with its base or the substrate it was growing on will help ensure its survival. Look for a healthy parent from which to obtain your frag, then make sure it is cut from the top to the base, including the base it is on. If obtaining a larger specimen, make sure there is evidence of it being collected whole and attached to its base or substrate. There are a few things that are needed to help this coral survive. They need a moderate, turbulent water flow. One directional water flow is not suggested, as it will stress the coral and not allow for polyp expansion. They do fine under Metal Halides, but beware of algae which can quickly overcome this coral. They can also grow under moderate lighting, but be sure to supplement them with fine particulate foods. Foods / Feeding Soft Coral Feeding: In the wild, Tubipora corals have developed several feeding strategies. They can capture planktonic organisms and microscopic food particles from the water column, absorb dissolved organic matter, and have a symbiotic relationship with a marine algae known as zooxanthellae, where they also receive some of their nutrients. In captivity, the Organ Pipe Coral will generally use bright light and zooxanthellae as their main food source, although Marine Snow, Artemia nauplii, rotifers and other fine particulate foods can be supplemented. Their knack for taking nutrients out of the water also will help their fellow tank mates. A refugium with at least a 4" sand bed is strongly suggested to help provide for this coral. Aquarium Care Stable tank conditions are needed to keep the Tubipora genus. High quality water is important, but it likes nutrient rich waters and can be sensitive to excessive skimming. Doing water changes of 20% a month or 10% biweekly is needed, although it is suggested that doing 5% water changes once a week will replenish many of the needed additives. Calcium and other trace elements can be added to maintain proper levels for good growth. An established live rock/reef environment is what is needed for your Organ Pipe Coral, along with some fish for organic matter production. A mature tank (well over a year old) with a refugium is advised to increase the successful keeping of Tubipora. Provide proper lighting and water movement. They do fine under Metal Halides, but beware of algae which can quickly overcome this coral. They can also grow under moderate lighting. They need a moderate, turbulent water flow. One directional water flow is not suggested, as it will stress the coral and not allow for polyp expansion. This is a peaceful species and can be kept with other species that are also peaceful. Compatibility and Social Behaviors The Organ Pipe Coral is peaceful and is usually fine within proximity to other corals that are peaceful. Any corals that emit strong toxins will kill your Pipe Organ Coral. They will not bother nearby corals since they do not have sweeper tentacles. T. musica may have small commensal shrimp, tiny bristle worms, or sponge living between the little tubes of calcite or within empty tubes. Breeding and Reproduction The Tubipora genus will continue to grow calcite tubes along its parameter. The best way to frag this coral is to break it away. Do not cut it horizontally from the colony, but cut from the top to the base, including the substrate or rock to which it is connected. Potential Problems The Tubipora genus can be fairly hardy, but can be susceptible to detritus collecting between the little tubes, and algae growing in-between, if the water is not at least moderate and turbulent. They are also susceptible to brown jelly disease. Siphoning off the jelly as it appears is helpful, along with an iodine bath as needed. Follow manufacturer's instructions. Availability Soft Corals for Sale: The Organ Pipe Coral T. musica is easy to find at pet shops and on line. Online they can run about $40.00 to $60.00 USD or more, depending on size and/or color.